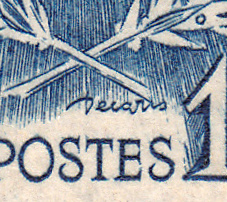 Albert Decaris Stamps! : I Muse...On a Cursive Revelation! 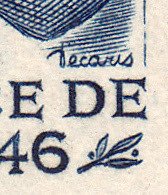 While compiling stamp images to do my France 1946 Year Set blog, I had somewhat of a durr revelation! 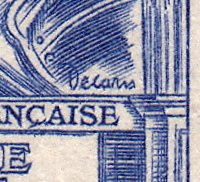 In my Luxembourg Palace blog - click HERE - I commented on the unique way in which Decaris signed his name to the stamp. It has been signed in cursive script. 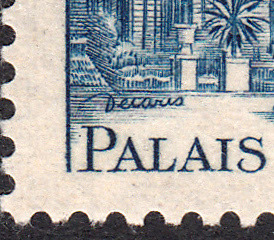 What I did not realise was that Decaris signed every stamp he engraved in 1946 in the same way! 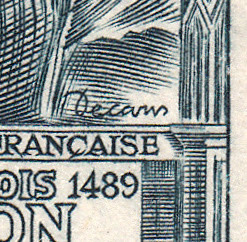 Just in case you don't believe me, I have arranged below a close-up image of the signature on each stamp Decaris engraved in 1946. Thank you...such an interesting engraver. Thanks! Yes, he was a truly gifted artist!